Intelligent Environments Limited have been appointed the New Zealand distributor for the CommandFusion range of affordable, scalable automation products. Whether you are a professional integrator, or a DIY enthusiast, you will enjoy the benefits CommandFusion has to offer. The modular design and competitive pricing will appeal to the professional integrator (please contact us about becoming a re-seller), whilst the DIY user will have fun discovering all the features, and the potential savings. The company was started in Australia in 2005 as ‘GuiLink’ but was renamed ‘CommandFusion’ in 2011. 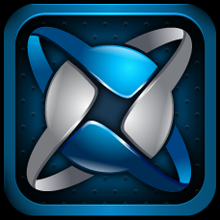 Their original focus was on the iOS app market, and their flagship software product (CommandFusion iViewer) was introduced in 2008. Now available for both iOS and Android platforms, iViewer still tops the field for flexibility and versatility. The company was started in Australia in 2005 as ‘GuiLink’ but was renamed ‘CommandFusion’ in 2011. Their original focus was on the iOS app market, and their flagship software product iViewer was introduced in 2008. Now available for both iOS and Android platforms, iViewer still tops the field for flexibility and versatility. Their hardware range was launched in 2012 realising the company’s aim to provide a cost effective, powerful, and scalable automation and control system. The company adhere to their core principals of reliability, flexibility and openness. Their staff strive to provide the best possible solutions to common problems with the automation and control industries. All hardware and software protocols are fully documented and readily available online. They also provide an extensive support network to ensure that implementation of their products is as simple as possible. “By documenting our protocol openly and providing multiple ways to interface with our hardware, our products can be used as affordable expansion boxes to any existing control system as well as a standalone system. iViewer uses the same core features for both iOS and Android platforms. The same tools can therefore be used to create your control interfaces on Apple and Android devices. The user interface for the iViewer app can be totally customised to create the look/feel you are after. Using guiDesigner, you are limited by your imagination alone! iViewer supports all Ethernet communication methods including TCP Client/Server, UDP Unicast/Multicast/Broadcast, HTTP/HTTPS. Unlimited ethernet devices can be controlled simultaneously directly from your mobile device, with no other hardware required. Adding control system hardware (either CommandFusion products, or any third party hardware) will enable you to expand your control to IR (infrared), RS232 (serial) or relay (contact closure). iViewer is highly configurable allowing easy creation of macros to handle multiple commands with customised delay requirements. A built-in remote debugger tool shows the status of connections, displays incoming data logs, Gui object states, and more. Simple operation via web browser connected to the device running iViewer. The powerful feedback processing engine allows you to capture data from any Ethernet device and process it for display. CommandFusion allows you to connect everyday objects such as AV devices, lighting, blinds/drapes, security and more, to create an integrated automation and control platform. CommandFusion prefers a wired approach for hardware, which can then be made wireless. 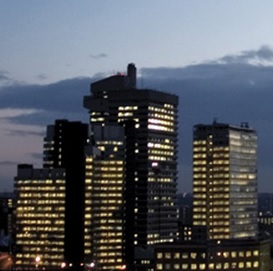 The company believes wired solutions to be inherently more reliable and secure. CFLink BUS testing was undertaken for over a year prior to commercial release. CommandFusion products are proven capable of withstanding common mis-wiring faults, and drops and fluctuation in voltage. DIN-Rail and Rackmount modular controllers meet all demands. CFLink provides a flexible data + power BUS, over-engineered to be fast, reliable and stable. With fully documented protocols CommandFusion hardware can integrate with any existing control systems. See below for diagram for a typical ‘whole house’ control solution using CommandFusion products. Typical residential application diagram for a typical ‘whole house’ control solution using CommandFusion hardware and software products. CommandFusion products are also widely used for commercial applications, including educational facilities, and places of worship. More information below. 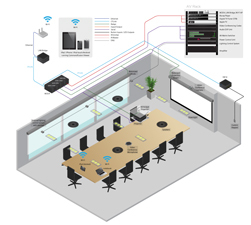 See below for diagrams for a small commercial control solution such as a boardroom, and a larger solution such as required for an office building. Both solutions using CommandFusion products. Example Boardroom (small commercial control) solution using CommandFusion hardware + software products. 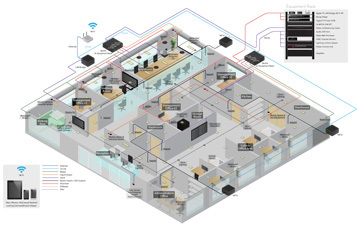 Example Office Building (larger commercial control) solution using CommandFusion hardware + software products. CommandFusion products are also widely used for residential applications (see above) and for other commercial applications, including educational facilities, and places of worship.